← What Is Cap and Trade? Safety and emergency response are critical to pipeline and distribution operations. In general, the industry has a very strong safety record. But every so often accidents do occur, and the consequences can be dramatic. 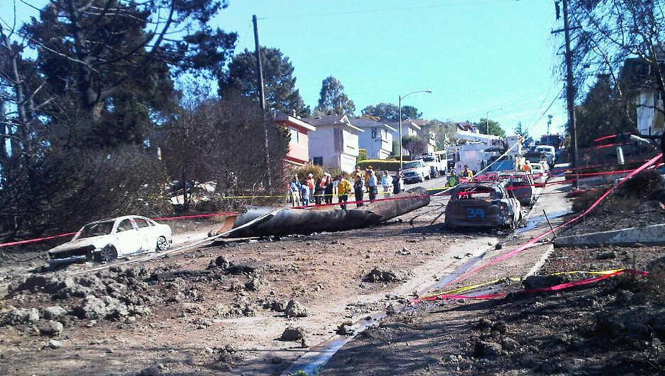 One recent example of such an accident occurred Sept. 9, 2010, in San Bruno, Calif., when a portion of the 30-inch diameter underground natural gas transmission system owned by Pacific Gas and Electric Company (PG&E) suddenly ruptured. Unfortunately, with 2.2 million miles of natural gas pipelines in the U.S., much of which was installed many years ago, it is likely that numerous other flawed pipes exist buried underground – literally accidents waiting to happen. The lead regulator for pipeline safety is the Office of Pipeline Safety (OPS) within the U.S. Department of Transportation. State agencies often also take a role in regulation, either implementing state safety legislation or working as agents for the OPS. As a part of OPS regulation, transmission and distribution pipelines must implement a Pipeline Integrity Management program. These programs provide for identification of pipe located in high-consequence areas – those with high risk of human injury or property damage if an accident occurs. Pipe in high-consequence areas must then be assessed to determine pipe condition, threats, and consequences should an incident occur. Pipelines then must develop specific mitigation plans to deal with identified threats. In the PG&E situation, all of the above were followed according to regulation; however the facts relating to the pipe’s condition were unknown. This resulted in a mitigation strategy that proved inadequate. So what can be done to avoid incidents like San Bruno in the future? The answer really comes down to weighing safety versus costs. Indeed, safety could greatly be enhanced by replacing all pipelines older than a certain age, but it’s highly doubtful consumers would be willing to pay the ensuing higher costs of natural gas. Instead, lawmakers and regulators must decide how to best balance consumers’ desire for low gas rates with improved safety measures such as more thorough yet more costly inspections and the installation of automatic valves. However, the effect of the bill was muted a bit by an added provision stating that outside of high-consequence areas, the pipeline safety regulator cannot issue regulations establishing leak-detection requirements or expanding integrity management requirements until a study and rulemaking process is completed, which will take at least two years. Meanwhile, California signed into law a bill that requires California pipeline owners to install automatic shut-off valves in vulnerable areas and to pressure test pipelines. And, in August 2011, OPS opened a new rule making to investigate whether rules for integrity management programs should be changed. Industry comments are due this month. It is safe to say that the San Bruno incident, coupled with other recent pipeline incidents, has caught the attention of legislatures, regulators, and pipeline companies. Already more stringent pipeline testing and installation of safety devices has begun as companies try to get ahead of the anticipated new regulation. Will our pipeline system ever be 100 percent safe? No. That’s just not realistic. But careful evaluation of integrity issues and reasonable system upgrades can and should reduce the number of future incidents. This entry was posted in Natural Gas and tagged Calif, California, California Public Utilities Commission, Energy Education, Energy Training, National Transportation Safety Board, Natural gas industry, Natural Gas Markets, Natural Gas Prices, Pacific Gas and Electric Company, Pipeline transport, San Bruno, San Bruno California. Bookmark the permalink. Pingback: Can Technology Improve Natural Gas Pipeline Safety? « Zap! Crackle! Pop! Glad you enjoyed this post and our blog in general! If you have any topics you’d like to see covered in future posts, please send us your ideas.